Banksy, the (in)famous political graffiti artist based primarily in the U.K., seems to be in town! The movie "Exit Through the Gift Shop," a documentary that's mostly about Banksy until the artist himself hijacks the film and turns its gazing eye upon the filmmaker, debuted here last Friday. 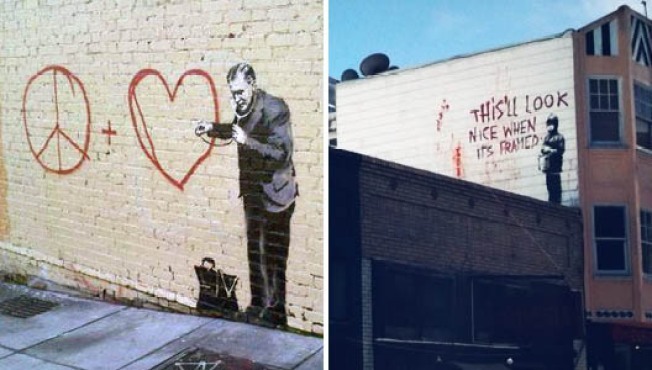 According to Warholian (via Spots Unknown), Banksy was "up early this morning bombing our lovely city." Banksy's witty visual puns gently remind us in this cynical age to check our jaded hearts — that, or buy tickets to his movie.